Since Virginia is a Shall-Issue State, an applicant cannot be denied a concealed handgun permit unless he or she is disqualified under Virginia Code. 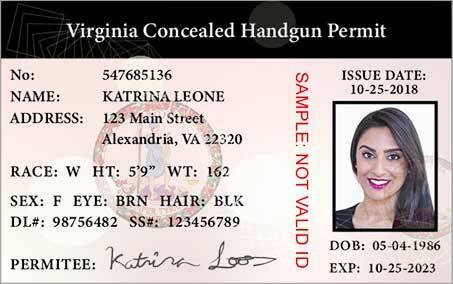 Virginia issues Resident and Nonresident Concealed Handgun Permits. A concealed handgun permit is not necessary when you are carrying a handgun in a personal, private motor vehicle or vessel and the handgun is secured in a container or compartment in the vehicle or vessel. More information on the transportation of firearms can be found on the Virginia State Police website. *Refer to Virginia state law for a complete list of regulations. Virginia law states that is illegal for any person to carry a (permitted) concealed handgun in a public place while under the influence of alcohol or illegal drugs. Virginia classifies this offense as a Class 1 misdemeanor. Virginia does not prohibit concealed carry in an establishment that serves alcohol. However, no person who carries a concealed handgun onto the premises of any restaurant or club that serves alcohol may consume an alcoholic beverage while on the premises. This law does not apply to a federal, state, or local law enforcement officers. Remember that concealed carry is off-limits when prohibited by the owner of the property. Refer to Virginia state law for the most current alcohol and consumption legislation. We try to keep the information on this page as up to date as possible; however, we strongly advise that you verify this information with your local circuit court or the Virginia State Police. The information on this page is for informational purposes only and not for the purpose of providing legal advice. Take the Official Virginia Concealed Carry Course Online! Open carry is allowed without a permit for people 18 years of age and older, but there are restrictions. Certain cities and counties disallow the open carry of assault weapons or shotguns with high-capacity magazines. These restrictions do not apply to valid concealed handgun permit holders. For open carry in a vehicle, the firearm must be properly secured in a container or compartment within the vehicle. The container or compartment does not have to be locked, the firearm may be within the reach of the driver or a passenger, and the firearm may be loaded. In most cases, open carry is generally accepted in the state of Virginia. However, there are cities and counties that have restrictions. Please refer to your specific city or county for more information on specific open carry legislation. You also may refer to Virginia state law for additional information.